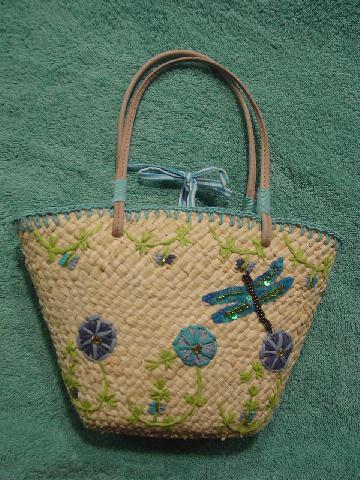 This never-used cute little straw purse has a close weave and the front has an elevated raffia flower and leaf design in chartreuse and various shades of blue. There are little gold bead accents on the flowers and leaves and an iridescent blue dragonfly with dark copper and blue-green beads. 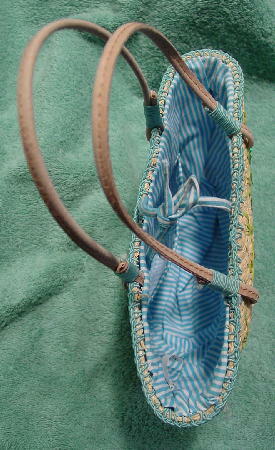 The top opening has a light turquoise accent cording. There are two 13" long by 1/4" wide faux tan leather handles with blue cording holding each one in place. It has a blue and white striped fabric lining with one open pocket and top ties.